Epic of Serinor: Dawnshadow Coming Soon! After 20 years using Verge, I've finally finished something! Epic of Serinor: Dawnshadow uses a very slightly modified version of the Verge 3.2 engine and will be available on Steam and itch.io on December 21. 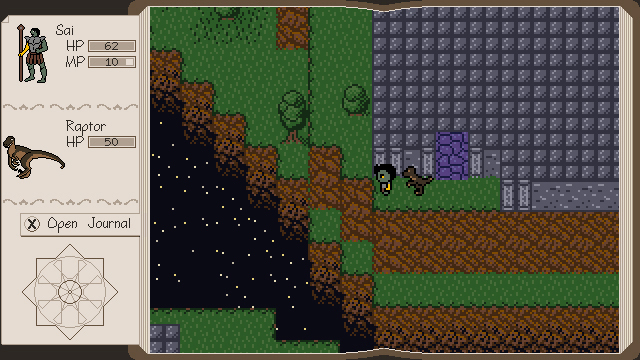 Dawnshadow is a modern RPG styled after the great 8-bit classics of old. It is the result of an individual quest to play an old-school RPG without having to play an actual old-school RPG and presents an original story and world in a classic style inspired by modern MMO and mobile gaming. You can find more information and store links for Dawnshadow at my devlog, and/or you can follow it on Facebook. I'm super excited. And almost too nervous to think straight. Hope to see you all on the solstice. It's amazing to me in this Year of Our Lord Twenty Eighteen we still have new VERGE games coming out. Very cool to see there's still Verge projects being made these days! Let alone Verge games that have plans for a Steam release! ^^ This looks like a cool RPG project, congrats on making this! It's neat to see Epic of Serinor go through so many changes over the years and see it's still going. also I like that story-book style HUD around the game! I think deprecating VC and a few other features was a bit of a misstep looking back, since their replacement (the VC-to-Lua cross-compiler) was never fully realized, although Kildorf did make some decent progress on it. I think we probably could bring back those removed features, and merge in the new changes. It looks like most development on Verge sort of froze in 2011, but it would be neat to make a small QoL style release that makes it usable on older VC projects again, and merges in the other changes. Wooo! Serinor has always been great, I'm glad to see it finally getting released! Good luck with the launch. Thanks everybody! It's good to hear from so many familiar names. Because honestly, even I'm surprised a new Verge game is coming out. But I've always wanted to make a game, and after all these years, Verge was the system I knew well enough to make that happen. Serinor has changed a lot over the years. Dawnshadow happens in the same world, but it has a much narrower scope than its predecessor. Which I'd like to go back to someday. But this one had to be something I could do on my own. I'd be happy to share the changes I made to the engine! I'm not sure how to make that happen, necessarily. And I don't know that the way I did it is the best way to do it. (I'm a writer, not a programmer. ) Dawnshadow essentially has two binaries: a Steam one and a DRM-free one. But it works! Realistically, Verge needs some updates before I'd use it again for a major project. Which makes me sad. I love Verge, and I don't want to learn a new system. Verge is very good at what it was built to do, but 10-15 years later, licensing and expectations have changed. If it had a free sound engine and I could publish to platforms other than PC, it might be different. I'm mostly rambling now, but I'm stuck in the airport, and my flight is delayed three hours. This is really neat! Did you use vc or lua? Dawnshadow is all vc. I've been coding in one version of vc or another for 20 years now, so it's almost second nature. I remember looking at lua when it was first incorporated into Verge. Then I looked at the existing vc codebase of all of my projects at the time and put it back down. I picked Verge for a development tool because I knew I could start building immediately without having to learn a new system. One completed project later, I remain comfortable with that decision. Getting something built, finished, and (self-)published is huge, and I don't know if it would have happened if I'd had to teach myself an entirely new language, IDE, or both. In retrospect, while I have a certain amount of fondness for Lua and I was definitely one of the people who pushed for (and worked on) removing it from the engine... it probably would have been better to just beef up VC. I was working for a while on a compiler to transform VC into Lua so it would still run, and I made some decent headway, but like so many other things, it fell by the wayside. No matter what you used to build it, it's awesome that some sort of Serinor got released. Infinite congratulations! Makes sense. I wonder what I'd really want in a "better vc". I think it comes down to what are the most irritating things to have to work around. Because anything I wanted to do, I could. It's just ugly sometimes. I think the biggest one for me would be having access to real floats. I ran into integer rollover issues trying to get good precision in Dawnshadow's damage calculation and had to break it up. And regeneration effects regenerate health unevenly. Again, I could have designed it better (and may yet) but it was one of the more aggravating bits to get working properly with only ints. Member functions or the ability to pass structs as arguments would have been occasionally useful, but they're not critical since everything is public. I made good use of two of the more recent additions to vc, specifically dicts and varargs. Those were very useful. And make sure to warn people if order of operations ever gets fixed. I know that I coded some things with the assumption Verge would read it left to right.